US STOCK - Pack of 25, Fast Delivery from NC or LA warehouse via FedEx, 3-6 days delivered. No importing duty. ENERGY SAVING - Save 57% on your electricity bill! 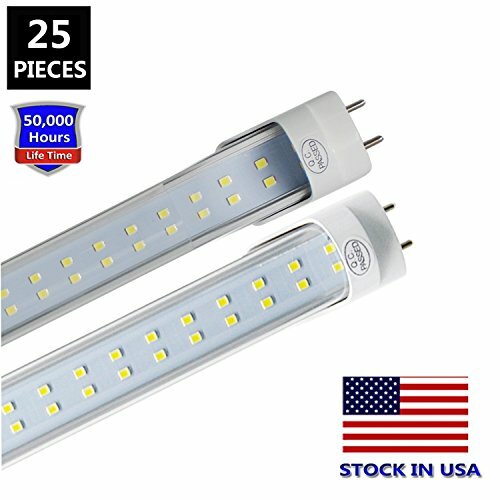 Replace 65W fluorescent tubes with 28W LED Tubes. NO STARTER AND BALLAST - Remove or bypass the ballasts (both electrical and Magnetic) is required, and remove the starter. NO DELAY, NO FLASHING - Our 28W LED Light Tube is engineered to light instantly when the switch is flipped. No more waiting for old fluorescent tubes to "warm up" or turn all the way on! No Flashing light, benefit for our eyes! HASSLE-FREE WARRANTY - JESLED offer 3-year unlimited warranty means we've got you covered! Contact us for an easy and fast replacement.